Gaelle Guerchet, of Malville, France – more than 500 miles away from Brighton – was nominated for being president of a sports group in Africa. Another torchbearer Ximo Peris, 42, London, has been nominated for holding media workshops for school children. Yet The Argus can reveal he actually created a film which was used by the London 2012 team when bidding for the games. Julia Zeen, 30, a freelance graphic designer from Brighton, was selected to carry the torch through Lancing by sponsors Coca Cola. She is currently designing the multinational’s range of pin badges for London 2012. The article also lists a number of inspiring local nominees who missed out on torchbearer places. 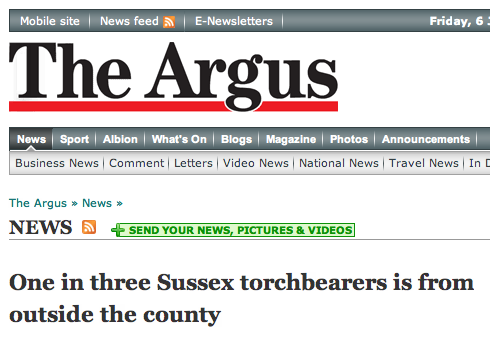 A full list of people carrying the torch through Sussex, with those from outside the county highlighted, is also on the site. This entry was posted in Links and tagged Charlotte Pemberton, Coca Cola, Gaelle Guerchet, Julia Zeen, Olympic torch relay, Sussex, The Argus, Tim Ridgway, torchbearers, Ximo Peris by Paul Bradshaw. Bookmark the permalink. I’ve noticed a surprising number of non-UK resident Chinese nationals – all middle-aged men – carrying the Olympic torch in Essex over the last couple of days. None of them have a nomination story but all have photos of themselves on the London 2012 website. Some kind of kick-back I wonder? Any one have any thoughts? What I am seeing is a mix of lies, deceit and corporate corruption. At the end of the day amongst other things, there will be a nation saddled by mountains of debt, whilst the ‘elite’ (Oh I despise that word) and their multinational corporations will be counting their increasing bank accounts and gold collections.